Our two new fillies are so different in personality. Splash is very shy and won’t come near me very often even though she is now over 2 months old. Missy is about 4 months old and is the first to greet me when I go to feed them. She loves to be touched and she follows me around, almost to the point of being a pest! 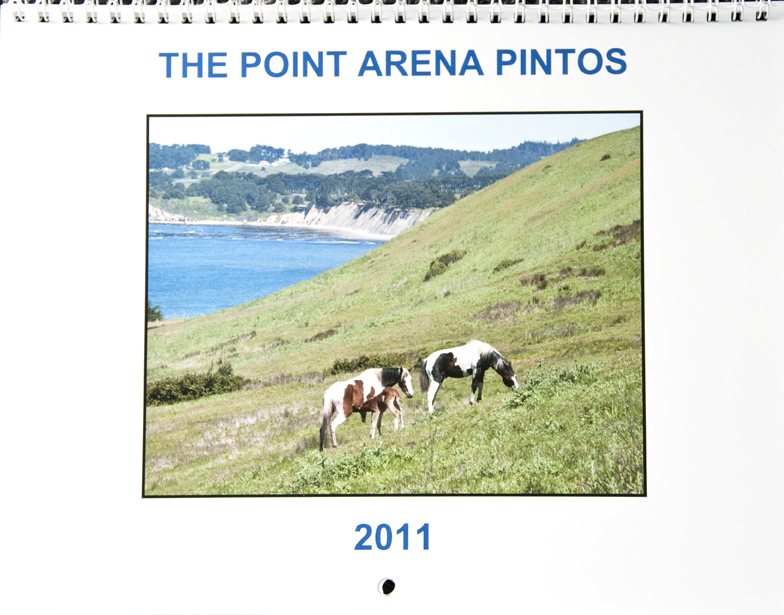 The 2011 Pinto Calendars have arrived. 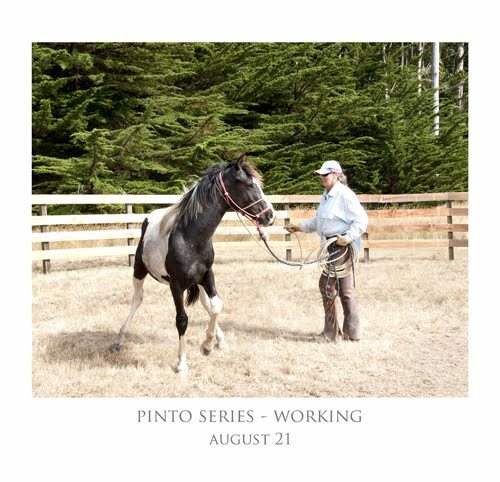 The calendar has all new photos which include the 2 new fillies born this year. It was a rainy and foggy year, so it was challenging choosing dramatic images. 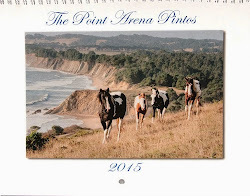 I am excited the way the calendar turned out and hope you will enjoy it as well. Profits from the calendar sales go towards the pintos care. The calendar sells for $17.95 at the Four Eyed Frog book store in Gualala,CA or you can order them from me directly by emailing me at pa@photographycreated.com. Orders cost $21.00 which includes shipping. 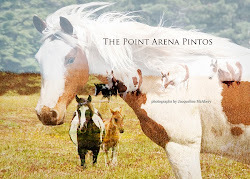 I have not posted for several months as it has been a busy time for the pintos and for my Photographic Art http://photographycreated.com business. 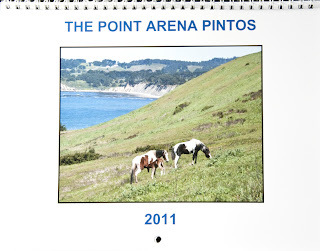 I have sent the first draft of The Point Arena Pintos 2011 calendar to the printers and will have them for sale in a couple of weeks. I will post the calendar once it is for sale. I have posted 5 new posts which may seem confusing as you read them due to the fact that blogging is suppose to be in chronological order which means the more recent events are at the top. 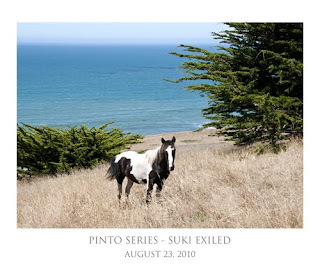 As you scroll down and read all the posts for September 4th you will get the whole story, especially regarding Suki. Thanks for reading this blog and be sure to let your friends know about us! 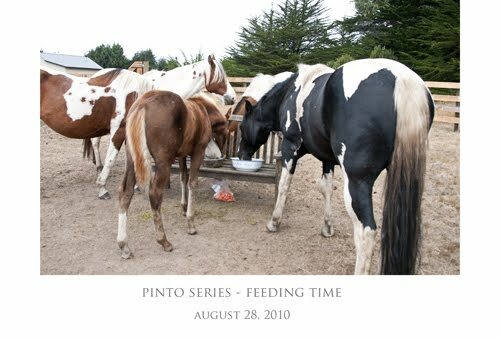 Originally only two horses would eat out of a bowl. Now all do except for Polka Dot and Splash. Polka Dot has always been shy and I have to throw the food down on the ground for her. 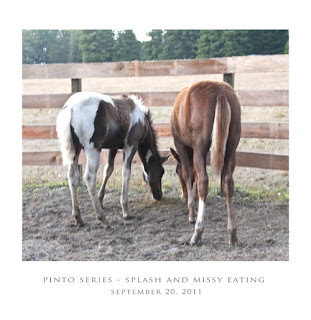 Splash like her Mom is shy and even though she is now 2 months old she has only come near me a few times….two times I was able to feed her some shavings from the alfalfa squares. Splash hangs outside the gate of the corral while the other pintos eat inside. At Kathe’s suggestion I have been slowly changing their diet…now they get a mix of Timothy grass pellets and a few squares mixed with water and flax seed. Eating at the bench is at times chaotic and so tonight I went around the pen and put out piles of food for them on the ground. 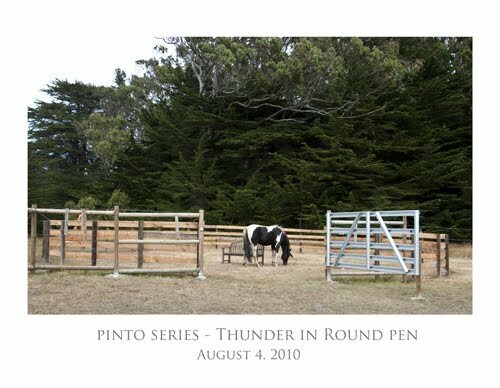 Of course the herd instinct kicked in and several horses had to eat at the same spot but little by little they each had a place and ate - of course Thunder went around and finished all the piles! The hope with this feeding method is to soon have a way to give Thunder and Lady only supplements added to their feed for arthritis but who knows if that will work out! The past 2 days I have gone over next door and to my relief Little One and Suki have been together. They stand side by side while I feed them. 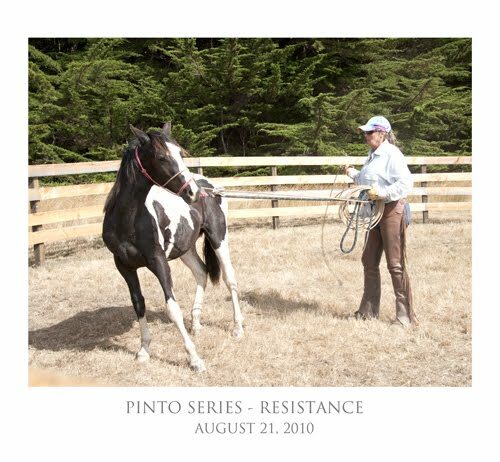 Since last March I have been going over there regularly to feed Little One and he follows me into the corral where he takes the food from my hands. 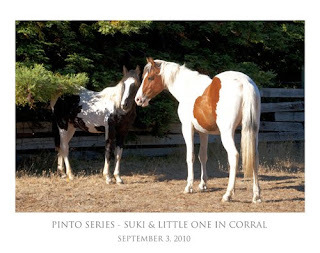 The first day I fed them outside the corral as I wasn’t sure if Suki would go in as the entrance is very narrow. Yesterday, I decided to see if Suki would go into the corral for food and he eagerly followed me in. Then I put a chair in the corral and spent an hour with both of them while reading my book and observing them. They are very sweet together and now they have each other. Little One who will not allow me to touch him, kept coming over and checking me out. Suki was more interested in grazing. It was a very peaceful hour the three of us had in the sun and I will remember it fondly. I learned many things the week-end of Suki’s training. But the most important lesson is that this is a wild herd and therefor unpredictable especially with Thunder in the mix. 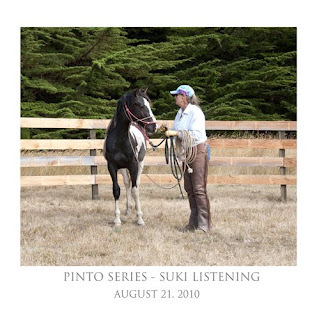 While Suki was in the round pen being trained the herd was often near by watching, grazing and curious. 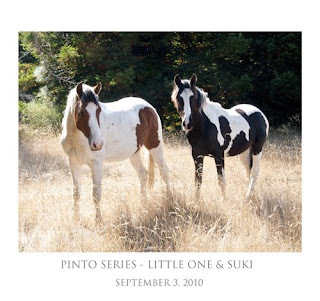 They were not in the least bit interested in going over to the property next door…they also acted as if they were waiting for Suki to rejoin them. 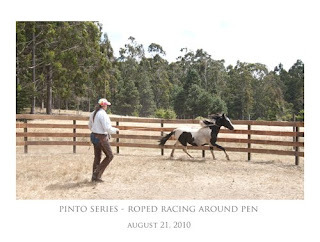 About an hour after Suki was finished for now with his training, I let him out of the round pen. 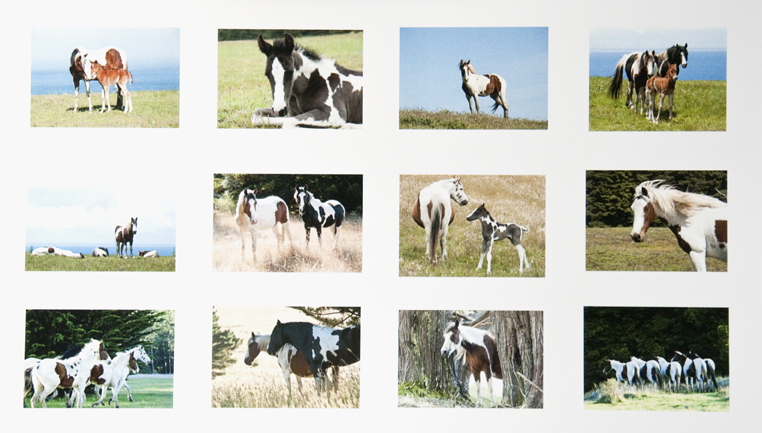 The herd was at this point in the meadow below and Suki ran off looking for them. That night the herd came up for dinner and Suki was not with them. He did not come up with them the next morning for breakfast, so I went looking for him and found him off by himself at the far end of the property below a hill, near the road with a view of the ocean. He had been kicked out by Thunder. Needless to say I have been very upset by this development and kept hoping that he would be able to rejoin the herd. I left the gate open to the property next door (as the herd had been going back and forth between the 2 properties) so the herd could find him or he could go find them. I went down to see Suki frequently and to touch him and as the days progressed he did become more restless when touched. After a week he was no longer by the ocean. A friend and I went looking for him at the property next door and my friend found him at the back end of the property near where Little One (kicked out of the herd by Thunder last March) has been living. 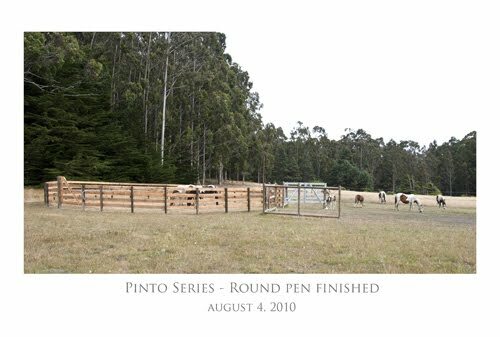 With the best of intentions, I had this fantasy that it would be nice to use the round pen as a place where the pintos could be seen by a vet or farrier if needed. However, that means they need to be use to wearing a halter. My plan was over time to get Suki, Sweetie, Little One, and the two new fillies comfortable with wearing a halter, being led around and being touched. Kathe Smothers, (http://quietmindhorsemanship.com) a trainer who follows Buck Brannaman’s techniques was in the area for a week-end, so it was decided she would work with one of the horses. 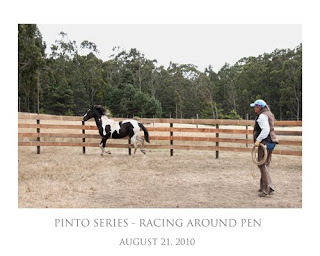 In the beginning we weren’t sure how we were going to get a horse separated from the herd and in the round pen alone….the gate was opened and Suki entered with another horse. It was either going to be Suki or Sweetie worked with that day. 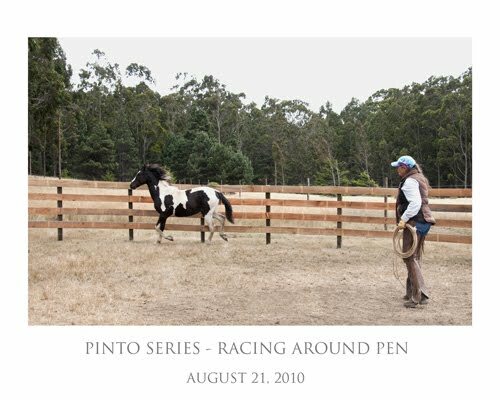 The other horse was let out and Suki was in for quite an experience. I have been able to touch Suki ever since he was born a year ago and he is a good horse but although smart, he was also stubborn, arrogant and was on the way to becoming like his dad Thunder. 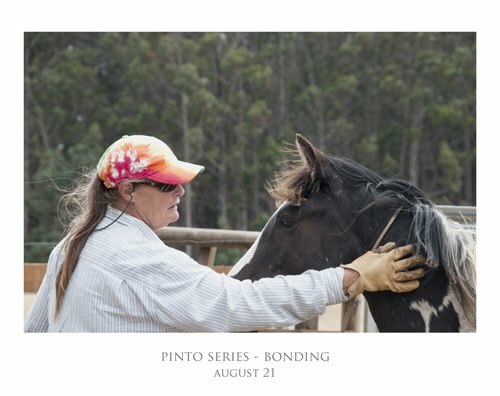 I really don’t want him to be like his father …even though I adore Thunder and he is a beautiful proud horse he is also very mean to the other horses – often for no reason. Kathe worked with Suki for 2 half days and at the end, I could rub him all over and he would stay perfectly still. Kathe taught me how to lift his front legs and he stayed calm and he is no longer arrogant. 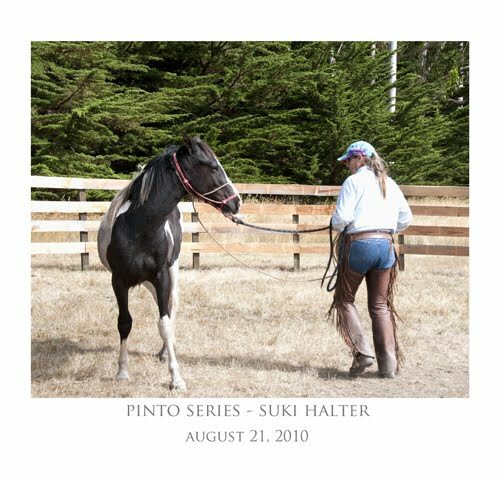 Below are some of the photos I took of Suki with his trainer. 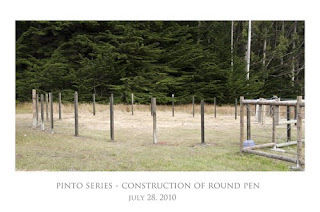 We are very fortunate to have a round pen for the horses.which came about unexpectedly. It was built by some friends, Eve Larson, Mike Denning and Allan Adams who did a great job with the construction and he used is own wood that he had milled. It is 50’ in diameter and about 5 feet tall. It turns out we didn’t make it quite tall enough if we want to train horses in it…it should be 6-7 feet high. If we decide to do any more training there, we will need to raise it. 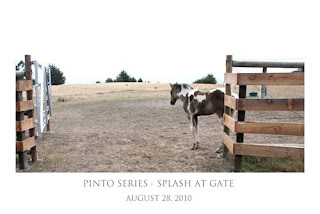 It is attached to the gate that leads into the fenced area for the horses.